This tutorial shows how to add a custom domain to an Azure Content Delivery Network (CDN) endpoint. When you use a CDN endpoint to deliver content, a custom domain is necessary if you would like your own domain name to be visible in your CDN URL. Having a visible domain name can be convenient for your customers and useful for branding purposes. After you create a CDN endpoint in your profile, the endpoint name, which is a subdomain of azureedge.net, is included in the URL for delivering CDN content by default (for example, https://contoso.azureedge.net/photo.png). For your convenience, Azure CDN provides the option of associating a custom domain with a CDN endpoint. With this option, you deliver your content with a custom domain in your URL instead of an endpoint name (for example, https://www.contoso.com/photo.png). Create a CNAME DNS record. Associate the custom domain with your CDN endpoint. Before you can complete the steps in this tutorial, you must first create a CDN profile and at least one CDN endpoint. For more information, see Quickstart: Create an Azure CDN profile and endpoint. If you do not already have a custom domain, you must first purchase one with a domain provider. For example, see Buy a custom domain name. If you are using Azure to host your DNS domains, you must delegate the domain provider's domain name system (DNS) to an Azure DNS. For more information, see Delegate a domain to Azure DNS. Otherwise, if you are using a domain provider to handle your DNS domain, proceed to Create a CNAME DNS record. Before you can use a custom domain with an Azure CDN endpoint, you must first create a canonical name (CNAME) record with your domain provider to point to your CDN endpoint. A CNAME record is a type of DNS record that maps a source domain name to a destination domain name. For Azure CDN, the source domain name is your custom domain name and the destination domain name is your CDN endpoint hostname. After Azure CDN verifies the CNAME record that you create, traffic addressed to the source custom domain (such as www.contoso.com) is routed to the specified destination CDN endpoint hostname (such as contoso.azureedge.net). A custom domain and its subdomain can be associated with only a single endpoint at a time. However, you can use different subdomains from the same custom domain for different Azure service endpoints by using multiple CNAME records. You can also map a custom domain with different subdomains to the same CDN endpoint. Any alias record type can be used for Custom domains if you're using Azure DNS as your domain provider. This walkthrough uses the CNAME record type. If you're using A or AAAA record types, follow the same steps below and replace CNAME with the record type of your choice. If you're using an alias record to add a root domain as a custom domain and you want to enable SSL, you must use manual validation as described in this article. For more information, see Point zone apex to Azure CDN endpoints. Source: Enter your custom domain name, including the cdnverify subdomain, in the following format: cdnverify.<custom domain name>. For example, cdnverify.www.contoso.com. Destination: Enter your CDN endpoint hostname, including the cdnverify subdomain, in the following format: cdnverify.<endpoint name>.azureedge.net. For example, cdnverify.contoso.azureedge.net. Sign in and select the custom domain you want to use. In the Domains section, select Manage All, then select DNS | Manage Zones. For Domain Name, enter your custom domain, then select Search. From the DNS Management page, select Add, then select CNAME in the Type list. Host: Enter the subdomain of your custom domain to use, including the cdnverify subdomain name. For example, cdnverify.www. Points to: Enter the host name of your CDN endpoint, including the cdnverify subdomain name. For example, cdnverify.contoso.azureedge.net. TTL: Leave 1 Hour selected. The CNAME entry is added to the DNS records table. After you've registered your custom domain, you can then add it to your CDN endpoint. Sign in to the Azure portal and browse to the CDN profile containing the endpoint that you want to map to a custom domain. On the CDN profile page, select the CDN endpoint to associate with the custom domain. The Add a custom domain page opens. 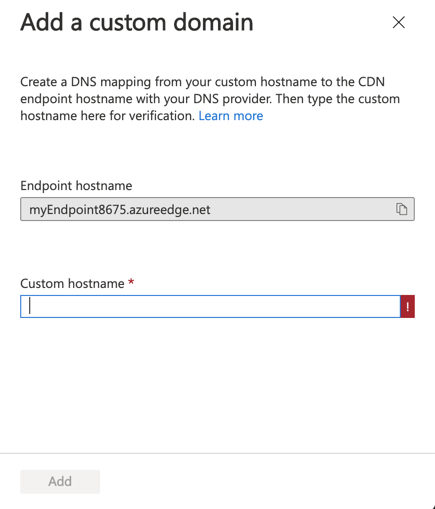 For Endpoint hostname, the endpoint host name to use as the destination domain of your CNAME record is prefilled and is derived from your CDN endpoint URL: <endpoint hostname>.azureedge.net. It cannot be changed. For Custom hostname, enter your custom domain, including the subdomain, to use as the source domain of your CNAME record. For example, www.contoso.com or cdn.contoso.com. Do not use the cdnverify subdomain name. Azure verifies that the CNAME record exists for the custom domain name you entered. If the CNAME is correct, your custom domain will be validated. For Azure CDN Standard from Microsoft profiles, propagation usually completes in 10 minutes. For Azure CDN Standard from Verizon and Azure CDN Premium from Verizon profiles, propagation usually completes in 10 minutes. After you have completed the registration of your custom domain, verify that the custom domain references your CDN endpoint. Ensure that you have public content that is cached at the endpoint. For example, if your CDN endpoint is associated with a storage account, Azure CDN will cache the content in a public container. To test the custom domain, verify that your container is set to allow public access and contains at least one file. In your browser, navigate to the address of the file by using the custom domain. For example, if your custom domain is cdn.contoso.com, the URL to the cached file should be similar to the following URL: http://cdn.contoso.com/my-public-container/my-file.jpg. Verify that the result is that same as when you access the CDN endpoint directly at <endpoint hostname>.azureedge.net. Source: Enter your custom domain name (for example, www.contoso.com). Destination: Enter your CDN endpoint hostname. It must be in the following format:<endpoint name>.azureedge.net. For example, contoso.azureedge.net. Host: Enter the subdomain of your custom domain to use. For example, www or cdn. Points to: Enter the host name of your CDN endpoint. For example, contoso.azureedge.net. If you have a cdnverify CNAME record, select the pencil icon next to it, then select the trash can icon. Select Delete to delete the CNAME record. In your CDN profile, select the endpoint with the custom domain that you want to remove. From the Endpoint page, under Custom domains, right-click the custom domain that you want to remove, then select Delete from the context menu. The custom domain is disassociated from your endpoint. Advance to the next tutorial to learn how to configure HTTPS on an Azure CDN custom domain.